It’s become quite the celebrity challenge, but don’t let that put you off. 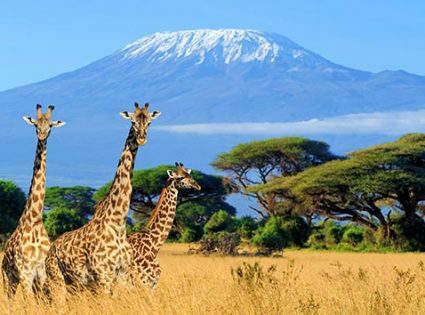 Climbing Mount Kilimanjaro tests your endurance, fitness and comfort levels. Many believe that the required strength and fitness for the climb are out of reach, but this just isn’t true. Sure it’s a mountain, but it doesn’t require any technical mountaineering skills, just one foot after the other. I climbed ‘Kili’ in 2008 and now have dreams of the Inca Trail, Aconcagua, and Denali. However, there are a few things that I wasn’t prepared for. Here I’ve collected the best insider tips for climbing Mount Kilimanjaro. I recommend wear-in a good pair of boots before the climb. But no matter how much training you do, after walking 4 to 10 hours a day for 7 days straight, the soles of your feet will feel like burnt marshmallows. I walked no more than 5kms in my boots before I took off for Tanzania (most people would think that’s insane) but my feet were fine, except when I had to beg Todd for his insoles on day five. Molded insoles give your feet more support and help prevent pain and tingles from long hikes. I highly recommend fitting a pair into your boots before the hike. Instead of forking out a lot of money for new gear, you can rent most of your kit from your tour guide. I hired a down jacket, walking poles and gaiters since I wouldn’t use them again regularly enough to justify the cost. But make sure you’re equipped for all weather conditions, as you’ll certainly encounter all four seasons. Packing light is also a big deal for your porters. They will overtake you each and every day on the mountain balancing your stuff on their head regardless of how much you bring. But this eventually leads to a guilt-trip, and that’s no fun at all. Altitude sickness can affect anyone, it doesn’t necessarily depend on your fitness or health. It helps to take Diamox tablets on your second or third day on the mountain, even if you’re not experiencing any symptoms. But beware: you will need to visit the ‘hole in the ground’ a lot more often than usual (for number ones, not twos). On my first day taking these whopper-sized pills, I had to scramble out of the tent at least 10 times during the night (no exaggeration). So it’s best to have an action plan and easy access to your clothes, shoes, torch and toilet paper before you go to sleep. Because when you need to go, it’s no time to scurry around the tent looking for misplaced items. Cards won’t be on your kit list, but they’re a must. On the mountain, you’ll want to sleep after a hard day’s walk, but card games with your climbing buddies are much more entertaining. There are lots of people to invite too: your guide, your assistant guide, your cook, your assistant cook… and your soiree of 10+ porters. It’s a great way to get to know them, their stories, and their culture, as well as learning new card tricks to test on unsuspecting victims back home. After walking for days to reach the highest camp, Barafu (4,600 m), all you’ll feel like doing is relaxing with a cold beer. And you can do just that! If you’re feeling generous and want to give some love to the porters, you can buy a whole round like I did. Coming from Australia, where everyone loves a good brew, I thought they’d be brawling over the suds. But it’s lucky I bought half Coca-Cola too because I soon found out the that the porters weren’t really keen on beer. So when in doubt, err on the side of Coke. Most people warn you against eating sliced fruit, salads, and anything else uncooked. But after burning 4,000+ calories a day on the mountain, you need all the replenishment you can get. When you’re back down in the city of Arusha, get out and try the local produce. Basically, anything that you can see being cooked should be fine to munch, and whole pieces of fruit (that you cut up yourself) will really hit the spot (look for pineapple). Summit day is the killer, and I’m not talking about that final climb up. Sure getting to the summit is tough, but the steep drop down the mountain afterward is the real test. Think about it, you take 5 days to get to the summit but only 2 days to get down. When the lubricating fluid in your knees runs dry, walking down a mountain can become very painful. On the Machame route, you cover a distance of 30kms on the Summit day alone and more than 2/3 of this is on the descent. I recommend packing anti-inflammatory meds for your knees since they act as your main shock absorbers on the way down. If you have ever thought about making the climb, now is the time to do it. The glaciers on the top of the mountain are slowly disappearing. Above all else, I want to recommend my guides, Joshua and Frank from Team Kilimanjaro, as they made the whole adventure seem like a walk in the park. They serenaded, whistled, and made jokes, all the way to the summit at 5,895 meters… the Roof of Africa.